Amanda Tocci: My name is Amanda! I am a hardworking, caring and ambitious person and I believe that if you want it all, do everything in your power to have it! I love to spend time with people, travel, learn and have fun! I moved from Portland Oregon to live in NYC where I met my husband and am now living in Long Island. I have been working in the health food industry for over 5 years and have continuously grown my career after graduating college. I have also become a health consultant, earned a certificate in plant based nutrition and have started my own holistic health brand and business, EAT Pur. LE: You work at KIND and you've recently launched EAT Pur. Congratulations! Tell us how you manage your job and your business. Also, what was it like the day EAT Pur launched. AT: It's been an incredible experience! Managing a demanding career in a company with exponential growth while also building my business can be quite the handful but when you are truly passionate about what you do, you will make the time and spend the energy doing it. I use every free moment including weekends, evenings after I am home from work, mornings, etc. and even use the time while commuting into NYC to work on EAT Pur as well. The day I launched my business was a feeling that's hard to explain. It was exciting yet nerve wracking and it felt overdue but I also questioned if I was ready. But I had an overwhelming sense that this just felt right and it was my purpose. AT: It was after a bad car accident I experienced in Oregon. After working for 4 years in the financial industry, and also working a side job, everything came to a screeching halt after my car accident and surgery. I had to go on a medical leave and recover for a few months which caused me to do a lot of self-reflection. I was always wanting to move to NYC or LA but as I progressed in my career, I kept pushing it off. After the incident, I realized how short life is, how being in a job that doesn't fulfill you isn't worth it and that the time is now to take risks. 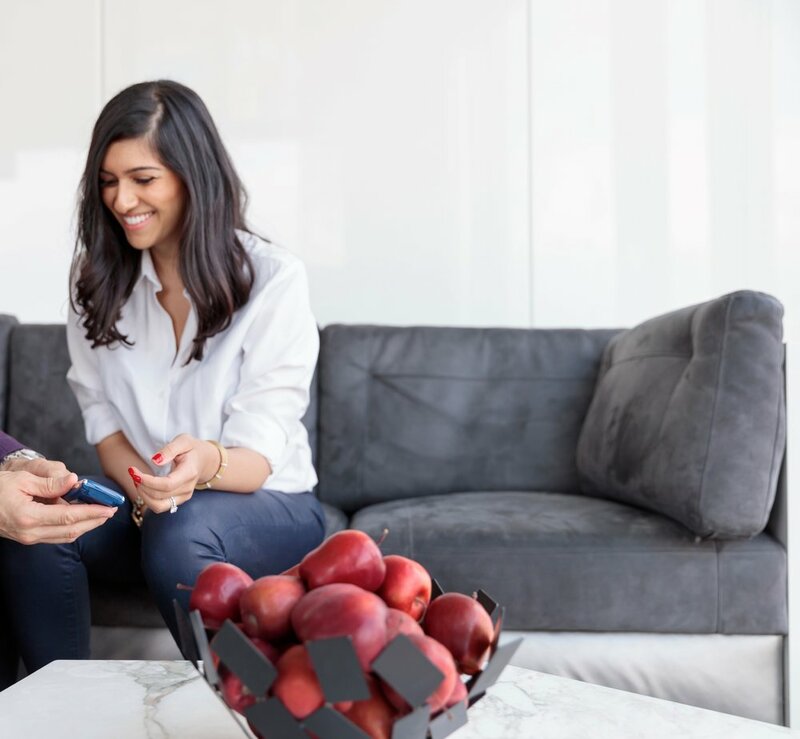 This was also the time that I became much more interested in health and nutrition and wanted to pursue a career that was related and one that had a social mission. This is when I decided to book a one-way ticket to NYC and actively pursue career opportunities with companies that were more aligned with my values and personal interests. The second breaking glass moment for me was when I met my husband. He is my inspiration and constantly motivates me to push myself out of my comfort zone and to see that I can be living a much larger life. He is the reason I had the courage to start EAT Pur, co-host a podcast and launch an online nutrition program. You don't have to wait to listen to her podcast. 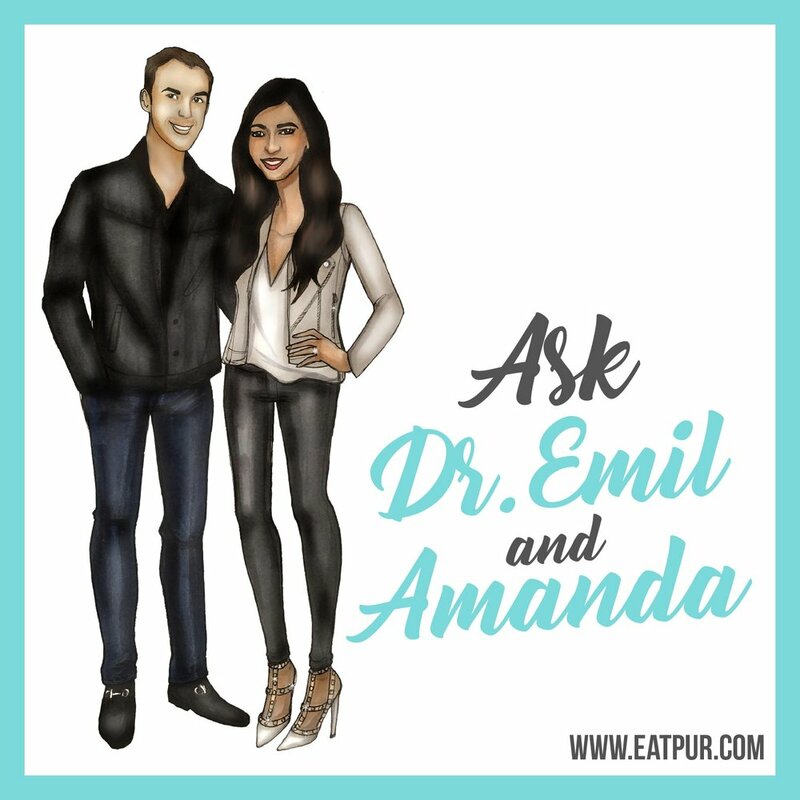 Click the image now to hear an intro to Amanda’s health and wellness podcast! Subscribe in iTunes. AT: I start off every morning with a moment of silence to take a few breaths, stretch, express gratitude and think of what I want to accomplish for the day. I try to not look at my phone until after I have done this. I drink at least 2 glasses of water, then coffee (with healthy fat) and then a blended green smoothie every day. I take the train into the city for work which is when I spend time working on EAT Pur. Then on the walk to work, I always listen to a podcast that educates and inspires me. I work in an office in Times Square and use this as an opportunity to continue learning and growing in a professional business setting. After work, I repeat the same routine of listening to a podcast and working on EAT Pur on the way home. I then workout, eat dinner and ensure I have a healthy breakfast and lunch option packed for work the following day. I then work on my business again after work until around 9 pm where I try to disconnect from my computer and cell phone and spend time with my husband. We both spend at least 30 minutes reading before bed and say 3 things we are grateful for before going to sleep. AT: For me, I have to sit with the struggle for a period of time. This allows me to think more clearly about a resolution and not be quick to act. I allow myself to be upset or frustrated initially but then I quickly jump into a mode where I tell myself everything will be ok and that I can overcome anything. I take small steps that are achievable to give me momentum to move in the right direction and keep in mind it's about progress, not perfection. This is my favorite quote because I think we sometimes end up living a life that we didn’t intend to live or become a person who is not reaching our fullest potential. We can sit passively by and allow life to happen to us or we can be intentional about taking action and shifting our mindset. Every moment in life is finite and should be cherished so if there is anything that drains your energy or happiness, you have the power to change it. It’s easy to get trapped by dogma or fall into a stagnant state so this quote is a great reminder that we each have our own unique journey and the potential to live our best life.Just a side note. She mentioned she has this quote hanging in her home office for a daily reminder. AT: Use every experience, opportunity, and interaction to learn and grow. Find a way to provide value to others and give. Each person has something special and unique to offer to this world. If you don't think you do, you just haven't explored enough and found it yet. Be authentic. No one is you and that is your superpower. Be patient and know that when someone doubts your ability, questions your dreams or puts negative energy toward you, it's their own insecurities that are being placed on you. Keep your focus on what you are doing and don't compare as everyone has a different journey. Always surround yourself with those who inspire you and push you to succeed and genuinely want the best for you. AT: I love cooking, walking on the beach boardwalk, learning and spending time with family and friends. Watch out world, Amanda is breaking glass on all fronts. Thank you for showing all Girls on the Rise how you can lead a corporate entrepreneurial lifestyle. I can't wait to see what is next.